Vallarta Supermarkets has been announced as the exclusive grocery retail sponsor of the historic Whittier Narrows Cinco de Mayo and Fiestas Patrias cultural festivals in Los Angeles. As part of its continued commitment to the Hispanic community, Vallarta Supermarkets has been announced as the exclusive grocery retail sponsor of the historic Whittier Narrows Cinco de Mayo and Fiestas Patrias cultural festivals in Los Angeles. 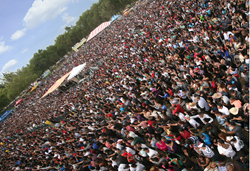 The annual Cinco de Mayo and Fiestas Patrias festivals at Whittier Narrows Regional Park in South El Monte are the largest of their kind in the United States. Del Rey Marketing and Del Rey Entertainment, the festivals’ organizers for the past 18 years, have partnered with Vallarta Supermarkets to create two world-class family events. The Whittier Narrows Cinco de Mayo and Fiestas Patrias festivals create a crucial sense of tradition, positivity, pride and unity among the Southern California Hispanic community, as well as having an invaluable economic impact on surrounding businesses. In 2014, Del Rey Marketing and Del Rey Entertainment will continue to celebrate this rich history as it commemorates 35 years of bringing Latinos together to celebrate their culture, heritage and music at these premier festivals. “We are thrilled to partner with Vallarta Supermarkets and continue their tradition of connecting with Hispanic consumers by staging further successful and historic events in the County of Los Angeles,” said Chris Del Rey, president of Del Rey Marketing and Del Rey Entertainment. The Cinco de Mayo festival is scheduled for Sunday, May 4, 2014. Marking victory at the Battle of Puebla on May 5, 1862, Cinco de Mayo is broadly recognized as a celebration of Mexican culture and tradition. Tickets for this free event will be available throughout California at 42 participating Vallarta stores. The festivities will include free product sampling, gifts and prizes. Families will also be able to enjoy performances by top Latino acts performing regional Mexican and pop music. Carlos Sada, Consul General of Mexico in Los Angeles, will conduct the ceremonial flag salute and lead the Mexican national anthem at the Cinco de Mayo festival. Celebrating Mexican Independence day, the Fiestas Patrias festival is scheduled for Sunday, Sept. 14, 2014. The Mexican American Opportunity Foundation (MAOF) is the preferred non-profit organization for both festivals. Vallarta Supermarkets is a fast-growing, independently-owned supermarket chain. For over 25 years, Vallarta Supermarkets has maintained an image characterized by family values, service, cleanliness, beautiful decor, a pleasant shopping experience and a large variety of products in all departments. The chain offers its clientele exceptional quality and outstanding service at great prices. Vallarta Supermarkets has grown to 42 stores throughout California (Ventura, Los Angeles, San Bernardino, Kern, San Diego, Santa Barbara, Tulare, Orange and Fresno counties). Del Rey Marketing is a leading multicultural shopper marketing and promotions company specializing in reaching the growing Latino consumer demographic across the United States. In conjunction with Del Rey Entertainment, the rapidly-growing company also directs and produces live events featuring Latin music artists to promote major packaged goods companies, retailers and Fortune 500 corporations. Founded in 1996, Los Angeles-based Del Rey Marketing is 100-percent Hispanic owned and operated.